The Webmaster would like to express his appreciation to all sources of information, including Burton and South Derbyshire's biggest-selling newspaper and Arnold Burston. "Festival of Music and Drums"
Daniel Whieldon, who lived at 74 Meadow View, Rolleston on Dove for many years became the winner of the first National Jazz Piano Competition held at the Albert Hall, Nottingham on Sunday 27th July 2008. The panel of judges, some of the UK's most eminent jazz pianists, chose the 27-year-old pianist, now living in Manchester for his real jazz sensibility, immaculate phrasing and fine technique. The competition was the culmination of four years preparation. It was borne out of a Nottingham company - Clement Pianos' search to find new ways of promoting the acoustic piano as a 'cool' instrument to play, while also helping young pianists to advance their careers. The company felt that jazz piano was an area that needed more exposure, as there are no other major solo jazz piano competitions in the UK, and only a small number around the world. 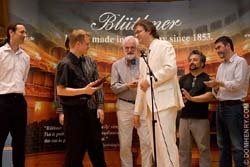 Bluthner Pianos ( Leipzig, Germany ) were very interested in the idea of such a competition and offered to sponsor the Competition by awarding the overall winner a Bluthner upright piano worth nearly £16,000. The competition attracted contestants from all over the UK, plus Canada and Europe. Daniel's selection of music for the final included his own composition 'Blues for Albert'. This was a spontaneous 12-bar blues and proved to be a great favourite with both judges and the audience. It took the four judges more than 40 minutes to deliberate, such was the high standard. In addition to winning the piano, Daniel will also be given the opportunity during the next 12 months of recording a CD of his music. Daniel completed a 4 year BMus(hons) course at Birmingham Conservatoire in 2002. He then spent a year at the Royal Conservatoire in Brussels studying for his Masters degree in Jazz music, studying Jazz piano. 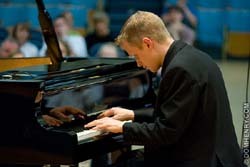 He now teaches piano - both classical and jazz at schools in Ampleforth, Yorkshire and in Stockport. He also plays with a jazz trio called 'Whackabas' and performs many gigs, mainly in the North of England. Rosa his fiancé plays clarinet in the Halle Orchestra. They will be married in Vigo, Spain on 17th August 2008. 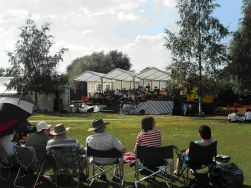 On 26 July an open air concert organised by the 1st Rolleston Scout Group was held at the Scouts HQ. Thanks to the 400 partygoers and the 200 band and staff who made the first Festival of music and drums a major success. We raised well over £2000, at what was one of the nicest way to raise money for the Tutbury Band and the Scout Group. The event was made up of over seven hours of continuous music and entertainment. First off were drum solos accompanied by backing tracks from the students of professional musician Mr David Armshaw, these ranged from hits from Queen to drum and base, an absolute cracking mix of music, then Tutbury Band Junior took the stage then followed by the Senior band. They both played for nearly 3 hours and the standard of music was superb, the Teddy Bears picnic was particularly enjoyed by our younger festival goers, and the chocolate they got certainly went down a treat. At 8pm we had a special visit from the dairy milk gorilla when a superb rendition of (in the air tonight) was performed by David Armshaw, and then the Stage was taken over by Black Magic Max, a cover band that rocked till the end of the concert, with my favourite bit of the night, performing a cracking performance of Chelsea Dagger originally by the Fratellis, but they certainly made it there own. The event went extremely well with the weather being red hot and the lager being ice cold who could ask for more. We are already planning the next concert for July 09, and then if all goes well the event will go Bi-annually with Tutbury Festival of music. (Report by Graham M Jacks). 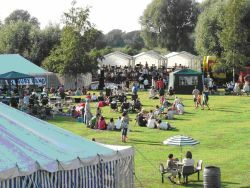 The event, held on Saturday 7 June, has been hailed as the most successful ever in its 20 year history with more than a thousand people attending - and £7,000 being raised for the school. On Sunday 18 May the village roads were very busy as good weather attracted a large attendance to this annual event. Ulrich Bihlmayer, a regular editor of Germany's Amateur Radio newspaper CQDL, has just written an article about Robert Ford, and was enquiring after him - he reminded me that if alive he would be celebrating his 85th birthday today (27 March). I have incorporated some of the information here, and would welcome any more news about this famous Rollestonian - a former Radio Officer to the Tibetan Government, who was arrested in 1950 by the invading Chinese army, spent nearly 5 years in jail, and in later life served in the Foreign Office in London, Vietnam, Indonesia, United States, Morocco, Angola, Sweden, France and finally as Consul-General in Geneva. In first place, with 97 1/2 points - Mrs Joan Doughty Mickleover and tied on 97 points - John Morris, Station Rd, Dr Staley, Alcester and Julie Eszrenyi, Walford Rd. Congratulations. Runners up on 96 points - Bellringers, St Mary’s and R. Ives South Hill. Mrs P. Alty, Twentylands and M. Slaney, Fairfield Ave. scored 95 1/2 points. Closely followed by Rachel Proudman, St Albans, Ruth S. Rosner, Macclesfield and the Bush Family, Walford Road on 95 points. On Sunday 3 February the Cotton Grass Theatre Company came to Rolleston. They presented two of Alan Bennett's award winning "Talking Heads" monologues. After introducing themselves with a witty ten-minute poetry recitation, they performed "A Chip in the Sugar" and "Bed among the Lentils", both of which get under the surface of "respectable" middle class life in a funny, moving and entertaining way. The show was a real treat for Alan Bennett fans, and for those who just like well-performed drama. The two pieces they chose have entertained audiences all over the nation, and were recently turned into a BBC series. The event was sponsored by Live & Local, with support from the Arts Council, Staffs. County Council and ESBC - this sponsorship enabled the local organisers, the Rolleston on Dove Special Events Committee (RODSEC) to keep the ticket prices down. The Civic Trust are extremely pleased to congratulate the ‘STAR-bucks’ of our village for attaining second place in the whole of the Midlands Region as the best Village Shop/Post Office. This accolade – very well deserved in everyone’s opinion – came about after being nominated in the Countryside Alliance’s Best Rural Retailer competition 2007. The aim of the competition was to recognise and celebrate the UK’s small independent retailers who are ambassadors, not just for their local businesses, but also for the communities to which they are central. To fulfil the requirements of the nomination it was necessary to illustrate what makes your chosen entry so special – no trouble there where such ‘STAR-bucks’ are concerned!!!! So ‘Congratulations’ and thank you to Andy, Patsy, Tom, and all the other very helpful and pleasant staff in our local shop/post office, for everything you do for our village and its residents – we couldn’t do without you – long may you continue. January saw several village roads flooded in Rolleston as shown by this photograph taken by David Yates. Thursday 10 January 2008 marked the 24th anniversary of the start (in the public domain at least) of the save the forest campaign. Purely for historical interest, newspaper cuttings spanning the two years of the campaign are loaded up at www.tutbury.org/forest. 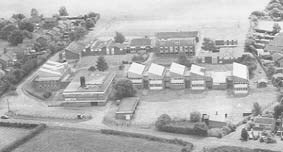 Friends and acquaintances of Jean Sprackland (nee Lockley), who was born in Rolleston in 1962, attended John of Rolleston School from 1967 to 1973, Forest of Needwood School 1973-74, and Wulfric School from 1974 to 1980, will no doubt be interested to hear that her third book of poetry, entitled "Tilt" was published by Jonathan Cape in 2007. It was shortlisted for the Costa Prize for the best book of poetry of the year, and was announced the winner in January 2008. The award will be presented at a ceremony in London on 22 January. As a winner of one of the five categories, her book will be considered for the overall "Best book of the year" prize, though poetry does not often make it to the top! Jean works part time on the Poetry Archive, maintained by the Poetry Society under the direction of Andrew Motion, the Poet Laureate, and also does free-lance work in schools and colleges throughout the country. She is currently engaged in a series of presentations in theatres and arts centres in London and elsewhere, reading her poems together with another poet and an actor reading short stories.